Avalon Organics Unscented Aloe Moisturizing Cream Shave, 8 oz. Avalon Organics Unscented Aloe Moisturizing Cream Shave nourishes and hydrates skin for an ultra-smooth, comfortable shave. Made with organic botanicals and essential oils, this plant-based formula provides razor lift and glide while helping to speed up the repair of nicks and irritation. Aloe vera, plant extracts and nutrient-rich beta-glucan work together to replenish and moisturize skin, leaving it feeling soft, smooth and supple. This certified organic shaving cream is made with non-GMO ingredients and no parabens, harsh preservatives, synthetic colors or fragrances, phthalates or sulfates. It is also vegan and not tested on animals. Includes one 8 oz. 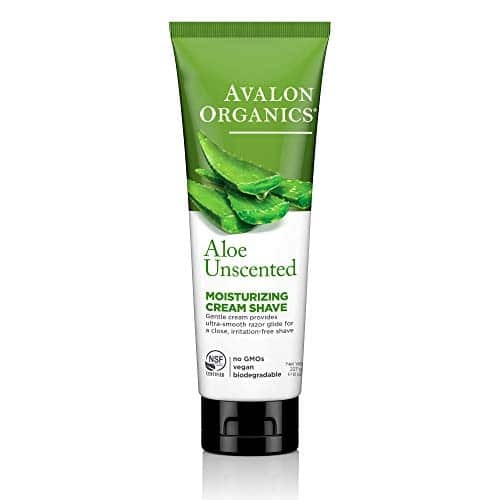 tube of Avalon Organics Unscented Aloe Moisturizing Cream Shave. Curated from nature’s pure resources, Avalon Organics NSF organic certified skin care, hair care and bath & body products are deep-rooted in a profound respect for the earth. Combining modern science with the botanical world, we constantly strive to perfect each formula, evolve expertise and deliver innovation. Searching out the beautifying benefits hidden within each plant, Avalon Organics thoughtfully develops formulas to not only nourish the body, but also nourish the mind and the soul. 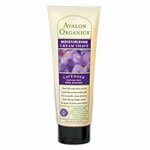 Avalon Organics Cream Shave, Nourishing Lavender, 8 Ounce. Moisturizing Cream Shave. A soothing blend of Lavender Essential Oil, Aloe, Beta-Glucan and plant extracts provides razor lift and glide while replenishing moisture and helping speed repair of nicks and irritation. Skin feels soft, smooth and nourished after every shave. Avalon Organics is grounded in the knowledge that all beauty begins within the Earth. Guided by the wisdom of nature, each product is thoughtfully crafted for optimal effectiveness while meeting a strict organic standard. Formulas contain carefully selected botanicals that are nurtured by the elements then tenderly harvested to nourish the body from the outside in. Deep rooted beauty is at the heart of the Avalon Organics Guiding Principles – ensuring that every product reflects a deep reverence for the planet and all it provides and contributes in its own small way to a holistic lifestyle of health, wellness and sustainability. CUSTOMERS SAY: Pure aromatherapy every time I shower with it! 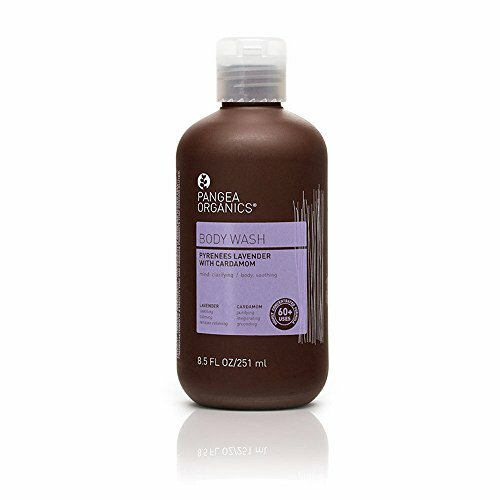 | Best organic body wash I’ve found! 100% Pure & Natural. 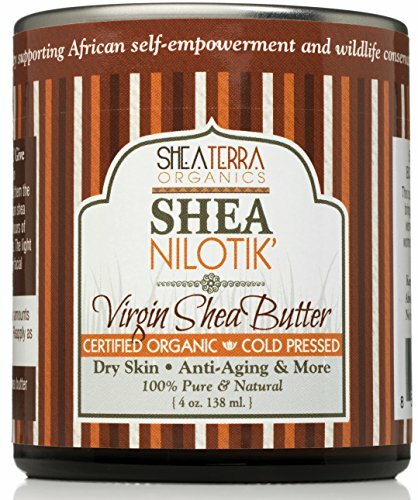 Shea Nilotica East African Shea Butter, is a rare healing, anti-aging shea butter from the Africa’s eastern regions. Unlike western shea butter which is often hard and waxy, raw, unrefined Shea Nilotica East African Shea Butter is creamy soft and easy to spread. Rich in vitamins A & E, this anti-aging butter is perfect around the eyes, on nails, cuticles, hair and more. ✔ INGREDIENTS: ECOCERT CERTIFIED ORGANIC 100% Pure & Natural. Shea Nilotica East African Shea Butter, isa rare healing, Anti-Aging Shea Butter From The Africa’s Eastern Regions. ✔ MOISTURIZER FOR DRY SKIN: Give Your Skin a Healthy Dose of Anit-Oxidents To Combat The Raves Of Time. ✔ ANGI-AGING CREAM: Rich in vitamins A & E, this Anti-Aging Butter Is Perfect Around The Eyes, Hair, Neck. ✔ HOW IT WORKS: Nilotik’ Shea Butter penetrates deep into skin delivering its vitamin E and plant sterols where you need from the most. Higher in olein. ✔ ORIGIN: Unlike Western Shea Butter Which Is Often Hard And Waxy, Raw, Unrefined Shea Nilotica East African Shea Butter is Creamy Soft and Easy To Spread. Rich in vitamins A & E.
No parabens, harsh preservatives or grapefruit seed extract. 100% Vegetarian Ingredients. No animal testing. Rinse skin thoroughly with warm water. Apply a thin, transparent layer of cream shave over damp skin. Shave normally, rinsing razor frequently. It’s in our name: Avalon Organics. Our commitment to organic agriculture extends beyond personal care formulation to a passion for home-grown sustainability, a cleaner global environment and, of course, personal health. Our dedication to these ideals is summarized in our pledge, Consciousness in Cosmetics: To honor our bodies and the world we live in by creating an extraordinary range of truly effective personal care products that are inherently pure, safe and certified to the Standard for Personal Care Products Containing Organic Ingredients. Each of our products is made with organic ingredients, including botanicals, extracts and essential oils. We honor ourselves, our planet and our users with the Consciousness in Cosmetics promise. Antioxidant-rich organic pomegranate juice. Replenishing pomegranate seed oil. Rich foaming shave. A nourishing blend of organic grape and pomegranate juices and replenishing pomegranate seed oil combine for a rich foaming shave that will leave skin smooth, silky and hydrated. Made in USA. No animal testing. Made with certified organic ingredients.